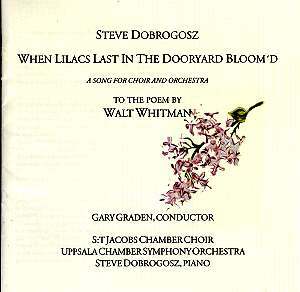 I first read Whitman’s remarkable poem ‘When Lilacs Last in the Dooryard Bloom’d’, as a teenager, in a fine anthology, The London Book of English Verse, edited by Herbert Read and Bonamy Dobrée. Read and Dobrée printed the poem in a section they headed ‘The Symphonic Poem’, made up of poems characterised by, as they put it, “the complexity of the emotions or ideas to be expressed” and demanding of the poet the skill of “comprehending a diversity of emotional responses within a single artistic form”. Their use of the word ‘symphonic’ is no accident; such poems are especially suited to large-scale musical setting, to the creation of extended musical works which express “a diversity of emotional responses within a single artistic form”. It has attracted a number of composers, including such works as Holst’s Ode to Death (1919), Paul Hindemith’s When Lilacs Last in the Dooryard Bloom’d (1946, commissioned by Robert Shaw) and Roger Sessions’s When Lilacs Last in the Dooryard Bloom’d (1966-70), described as a Cantata for Soprano, Contralto, Baritone, Mixed Chorus and Orchestra. Now here is a setting by Steve Dobrogosz. Born in 1956, Dobrogosz was brought up in North Carolina, before attending Berklee College of Music. Since 1978 he has lived and worked in Sweden, based in Stockholm. Classically trained, Dobrogosz’s early reputation was in the fields of jazz and jazz-influenced popular music. His work as accompanist on the 1982 album Fairy Tales, with the memorable Norwegian vocalist Radka Toneff has rightly attracted a great deal of praise. In later years he has worked with other fine vocalists such as Jeanette Lindström and Anna Christofferson. Since the early 1990s he has also been writing ‘classical’ scores, including chamber and orchestral works and his choral works (notably his Mass of 1992) have been quite widely performed. His writing, including this setting of Whitman, is traditionally tonal. I have no objection to that, of course, but I have to confess that, overall, I find this setting disappointingly unmemorable, even a little bland at times. There are some good things – Dobrogosz is perhaps at his best in the more purely pastoral passages. The opening orchestral introduction has a restrained dignity that is appealing and he responds attractively to the lovely lines early in the poem (“In the dooryard fronting an old farm … A sprig with its flower I break”. The disappointment is that there isn’t enough distinction of musical idiom between the writing here and that for the immediately preceding, far more exclamatory passage (“O powerful western fallen star! … O harsh surrounding cloud that will not free my soul”). The setting too often lacks the kind of rhythmic variety necessary to so justice to a poem which, to quote Read and Dobrée for a last time, is characterised by a “diversity of emotional responses” (my italics). It is that diversity that I largely miss here. Dobrogosz’s music is everywhere very competent, sometimes much more than that. Some of the writing for the soprano voices is very beautiful. But it isn’t sufficiently differentiated, sufficiently full of contrasts to do justice to the sheer variety of attitude in Whitman’s complex text. More than once I wondered if the decision to write a piece for choir (without soloists) and orchestra wasn’t perhaps a mistake? The presence of passages, set pieces even, arias, recitatives or whatever, for individual voices might have helped to generate that absent sense of contrast and juxtaposition, that musical registering of poetic and linguistic differences which seems to me not sufficiently pronounced. Naturally Dobrogosz splits his choral resources, writing passages for male or female voices alone, for example, but this doesn’t prove sufficient to break up an over-homogenous (i.e. over-homogeneous for this text) musical texture. This is by no means a bad piece of work; it is intelligent, technically assured and well performed. But to listen to what either Sessions or, especially, Hindemith do with the poem is to hear the limitations of Dobrogosz’s version of it. Where Hindemith draws on a huge variety of resources – including a sinfonia, marches with chorales, arias, double fugues, choruses, fanfares, complex polyphony and much else – this newer setting is content to operate within narrower parameters. Hindemith’s setting opens with grainy orchestral textures, some of his almost violently expressive writing, and moves to closing raptness and acceptance. The musical trajectory of Dobrogosz’s setting is less dramatic, its emotional antitheses less marked than those of Hindemith and, more relevantly, less vivid than those of Whitman’s poem. This new setting does what it seeks to do, musically speaking, pretty well – but it seems to me that what it wants to do isn’t really enough to embrace the poem’s power.